In our organization chart (download here) you can see how we are organized. We are a small and flexible organization always looking for new business opportunities and always focused on helping our customer. Ruud Schellekens, CEO and co-owner, a general ‘people’ manager with over 25 years of professional experience in a broad variety of branches and techniques in a B2B environment. His specialty is building or changing an organization around people instead of the other way around! It is his believe that lasting results are only generated by motivated people that have fun at what they are doing. Jean Pierre Hoefnagel, CTO, founder and co-owner. An innovative mind, always full of ideas and with the capabilities to actually realize those ideas. With an in-depth knowledge of both hardware, software and mechanics he has all the competencies needed to create out of the box solutions to our customers. 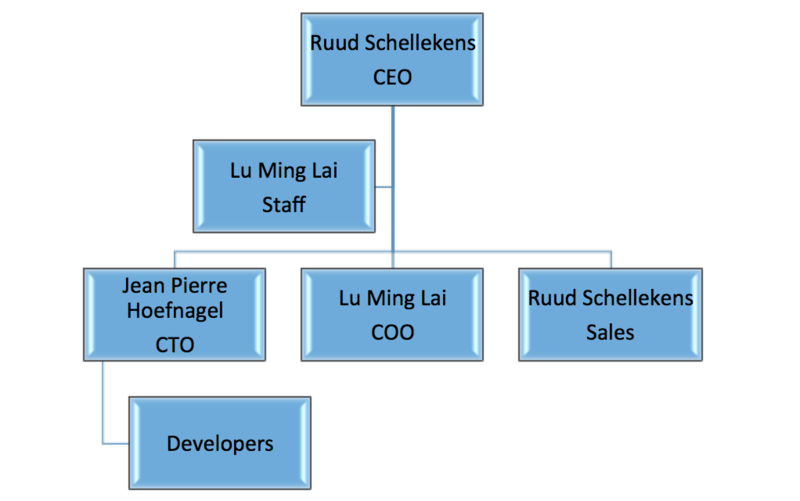 Lu-Ming Lai, COO, With a master degree in psychology and her 7 years’ experience in techno companies, she is the mirror for both Ruud and Jean Pierre. Brings them back to reality when needed (fortunately not too often). She keeps the balance and is simply bright in organizing everything! Our Developers, We work with a team of developers in various areas, like antenna design, PCB Layout, Embedded Software, Server Software and housing. The experience of our engineers in similar projects during the last 10 years and other projects before that gives us 120 years of engineering experience in-house…..
Our origin lies in a Dutch company called Embedded Designers B.V. This company was founded early 2004 by Jean Pierre Hoefnagel and its main activity was and is developing GPRS/GPS based track and trace solutions, both hardware and software, server-side and application/analysis/presentation software. In the past 10 years we built up a lot of experience in developing all components needed to realize a great number of customized solutions. In June 2013 we came across Sigfox, and it was immediately clear that Sigfox is a system that enables us to develop for markets that were impossible to develop with GSM. For economic reasons, but also for power consumption reasons. For a few months the Sigfox development activity was done by Embedded Designers, in parallel with GPS/GSM based solutions. However, after a few months and lots of new ideas we realized that the potential in Europe and the rest of the world is so huge that it justifies the founding of a new daughter company with only one focus: Low Power WAN applications.